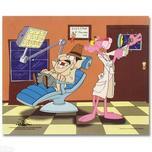 The Pink Panther cartoon character is the main character in a series of animated short films. The character originally appeared in the opening and closing credit sequences of the 1963 live-action feature film The Pink Panther. The popularity of the character spawned a series of animated short films, and the character would appear in the opening sequence of every film in The Pink Panther series (except A Shot in the Dark and Inspector Clouseau). 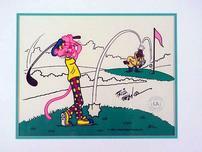 The cool cat starred in one-hundred twenty-four shorts (either theatrical or made-for-television), ten television shows and three prime-time television specials.